Note: Before you can install and use the Apigee Monitoring Dashboard, you must complete the Apigee Monitoring Dashboard Evaluation Agreement (PDF - right-click the link and select Save Link As) and return it to Apigee by emailing it to orders@apigee.com. 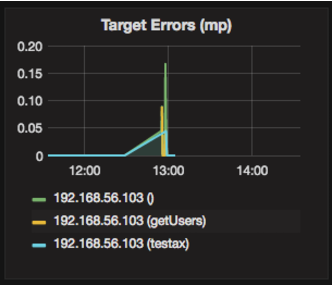 where grafana_IP_or_DNS is the IP or DNS name of the node running the Apigee apigee-grafana component. You will be prompted to enter the administrator's username:password as defined when you installed apigee-grafana. The default values from the installation instructions below are admin:admin. Select the logo in the upper-left corner to open the menu bar. In the menu bar, select Pin to keep the bar open. admin Main Org. to set administrator details, such a password and email address. Dashboards > Home to open the screen shown above. 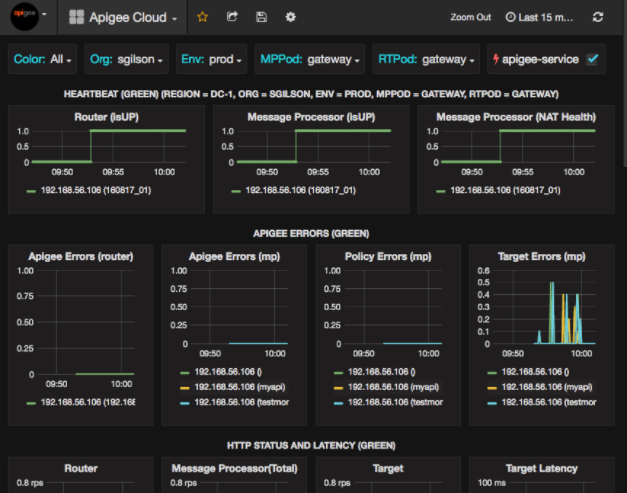 Then select Apigee Cloud or Cassandra Dashboard to see the dashboard. Data Sources to see the data sources for the apigee-grafana component. Select each data source, and then select the Save & Test button to validate the connection. Plugins to display the list of installed plugins. Admin to set information about Grafana. Router: status, traffic, errors, load, and more. Message Processor: status and health, traffic, target latency, target response codes, and more. Node metrics: CPU usage, disk space, heap usage, and more. Color: set to All. All is the only supported option. Org: set to the name of your organization. Env: Set to the name of an environment in the organization. MPPod and RTPod: set to the pod name of the Message Processors and Routers. By default it is "gateway" unless you changed it at install time. apigee-service: check to display information about executions of the apigee-service utility. There are also individual lines in the chart for different API proxies named getUsers and testAX, identified in the chart as the orange line for 192.168.56.103(getUsers) and the blue line for 192.168.56.103(testax). By default, the dashboard shows information for the last 5 minutes. Select the Today at the top-right of the dashboard to select a different interval. To help Apigee diagnose and debug an issue, you can send a snapshot of your dashboard to Apigee Support. Apigee can then inspect your dashboard to help determine the cause of the issue. In the pop-up window, select Snapshot Sharing. Leave all fields as they are, and select the Publish to snapshot.apigee.net button. A pop-up window appears containing a link. Copy that link and send it to Apigee. A wrapper component for telegraf, that gathers metrics from the system and running components and pushes them to the apigee-influxdb Time Series DataBase (TSDB). Install this component on all Edge runtime and data components such as the Edge Message Processor, Router, Postgres server, Cassandra, and Zookeeper nodes. A wrapper component for influxdb, that stores the metrics data and exposes it through an API so the data can be rendered in a UI by using apigee-grafana. Install this component centrally so it can be accessed by all the apigee-telegraf components running on individual Edge nodes. 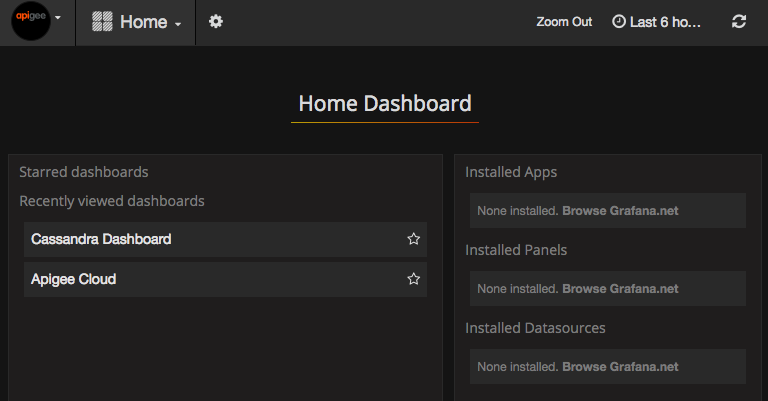 A wrapper component on top of grafana, that provides a powerful and elegant way to create, explore, and share dashboards and data with your team and Apigee for troubleshooting. Install this component on the node where you want to view the dashboard.